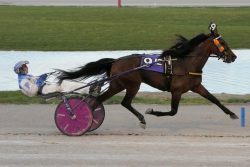 Lebanon, OH — Mission Accepted (Chris Page) won the $25,000 Open Trot at Miami Valley Raceway for the second straight time to start his 2019 campaign on Sunday (April 14), overcoming the assigned outside post to top Pine Dream (LeWayne Miller) and No Whip Chip (Dan Noble) in 1:54.3. Mission Accepted dominated the $25,000 Open Trot at Miami Valley for his second straight win to start his 2019 campaign. Conrad photo. Earlier on the program, Bugatti Beauty (Noble) extended her win streak to six at Miami Valley. Plucked from a $5,000 claiming event on March 1 by In To Win Racing Inc. and trainer Zach Tackett, the 7-year-old Art Major daughter has since reeled off two triumphs at the $5,000 level, one for a $6,500 base tag, one for a $9,000 tag and the last two carrying a $12,000 (plus allowances) price. Her latest gate-to-wire success was her 19th in a career which has netted $156,725 in purses. Racing resumes Monday afternoon at Miami Valley with a post time of 2:05 p.m. Featured on the card, in the third race, will be the first of four $40,000 James K. Hackett Memorial championship races for Ohio-sired 3-year-olds over the next week. Bella’s Rose Power, one of five Chris Beaver trainees in the race for sophomore filly trotters, is the 2-1 morning line favorite off an elimination win last Monday in 1:55.